Whazzup all you cool people? I have a sweet makeover to share with you today facilitated by my nice neighborly pals over at Ace Hardware, (thanks Ace, you da best!). 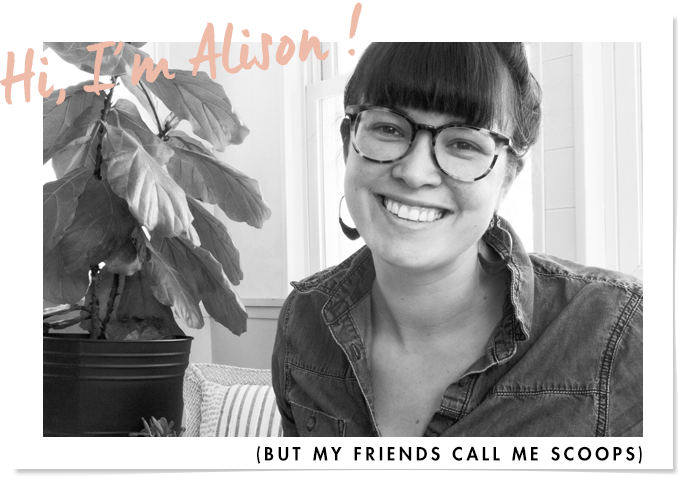 Us Ace bloggers were asked to get really in depth on a project this summer, something that we were really itching to get at. I knew right away that I had to tackle my garage. I have a few good reasons for this. 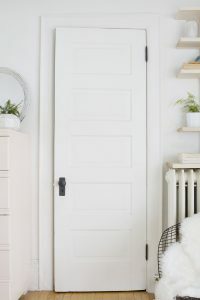 Firstly, the exterior of it is so boring; white vinyl siding paired with a plain white aluminum door leaves much to be desired. I’m thankful that the garage is newer and not slanting to its side like so many of those hundred year old garages around here, but it needed a facelift for sure. Secondly, the interior (which I’ll get to in a future post), is filled to the brim with tons and tons of crap – you know, all that stuff that doesn’t go anywhere else – and needs to be sorted through and organized. Here in MPLS (aka Minneapolis) most of us residents access our garages via an alley way behind our homes. Now, this is nice for many of us, it prevents our small-ish (all is relative) yards from be eaten up by driveways, sadly though, there is a down side to alley lyfe. It is not popular in my neighborhood to keep a pretty garage or alley facade. Alley ways are strictly utilitarian and are strewn with garbage cans, recycling bins, yard waste and so on. It should be noted, that I carefully cropped a temporary port-a-potty out of these pics – point is, anything goes in the alley. I didn’t want my garage to fall by the wayside like so many others and wondered what would happen to the culture of our alley if I spent some time and gave it a quick but purposeful face lift. Could I inspire other folks in the neighborhood to pretty up their alley appeal™ too? I purchased a can of paint, some painters tape, a set of faux windows, and some decorative hardware, and guess what? The garage looks way better! Now, this isn’t my dream garage, and I know it looks a little fake-y, but when you’re putting lipstick on a pig, isn’t the lipstick better than just the ugly old pig? I think the answer is “heck yeah it is”. Of course I topped it off with my number one pretty-it-up-go-to-solution, FLOWERS, dur. Earlier this summer I threw some Morning Glory seeds in the planters I built last summer and added some impatiens and cascading petunias to the flower boxes as well. The dirt piles on the edges of our concrete pad got a flower facelift too. I used some tall ornamental grasses (King Tut), a few Day Lilies and Hostas transplanted from the backyard, and Zinnias to make those dirt patches shine. All alleys deserve a little flower love. The house numbers got updated too, I had an extra set of nums from when we had the house painted a few years back. I quickly mounted them on a board painted white, and attached the spiffed up numbers with a few wood screws, and blamo! I didn’t know this was a thing, but when researching how to make my garage prettier, I ran across these faux windows . 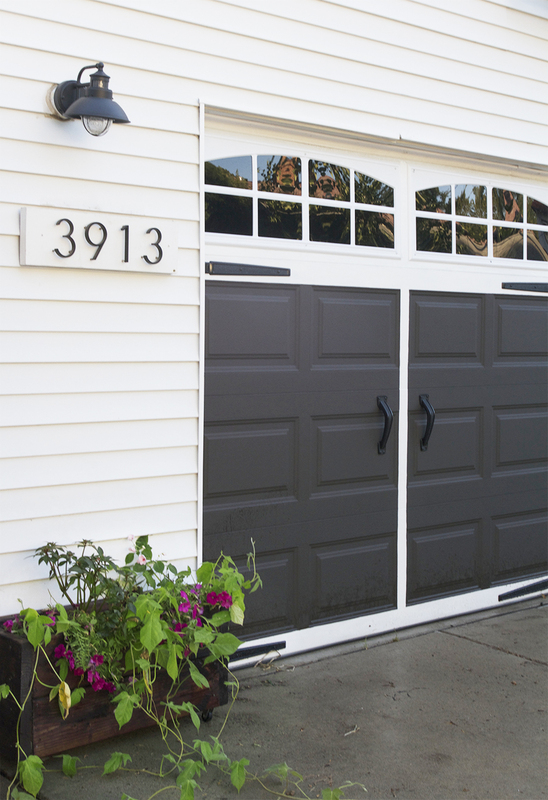 They are black plexi-glass trimmed out in paintable vinyl to give the appearance of real live windows, and they can be attached to most typical garage doors in just a few minutes. The down side is that you get one design option. I searched and searched, but I could only come across one manufacturer producing one type of faux window. Beggars can’t be choosers, and even though it wasn’t my preferred faux-window-style, I decided to go for it. After all, I was after a carriage-door look, and all good carriage doors are known for their iconic windows – I’m sold. To complete the garages new look I needed to fancy it up with some decorative hardware. Guess what? They make decorative hardware fer garages too! I didn’t want anything super ornate and was able to find simple hardware on this thing they have called the internet. 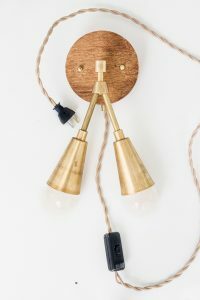 Hey, if you try and take on a project similar, here are a few cool tips to take note of. ↬ Check the weather, you don’t want to start this project if rain is in the forecast. ↬ Don’t paint on a hot day in direct sunlight, the paint will gum up. Make sure to paint on a cool overcast day or in the shade. 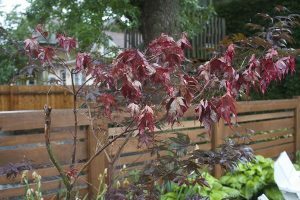 ↬ Use exterior paint! This garage will need to stand up to a lot of weather wear so make sure you are making the proper paint choice. I talked to my bros over at Ace and they recommended Clark+Kensington exterior paint (in flat) and they even color matched it to match my storm windows. ↬ Roll on your paint and then use a brush to smooth it out. It’s obvious when you use a roller, so make it look natural and use a brush to smooth out the rails and stiles of the garage door. All in an afternoons work – so get out there and pretty up your neighborhood alley-way already! Tell me, does your house or apartment have an alley too? How does your neighborhood approach alley appeal? Hey AnnMarie! I hope the porta potty is gone soon too! Thanks! I don’t think it looks super-fake, either. And, it *is* an alley – do you really want to plunk multiple grands down in the alley? I grew up in the civilized land of Dallas, where alleys were abundant. I think they’re great! When I moved to Houston (after college) I was all – what kind of savagery is this?! And now, in my current living situation, I have neither alley nor driveway, just the thunderdome that is on-street parking (and 90% of the curb space in front of my house are “no parking here to corner” so we’re super-screwed). But, a few blocks in my town have alleys (it’s a teeny-tiny town, so I actually know all the streets) and the residents treat them like a train yard. No good! You need to start the Alley Style trend! Hey Stacey! 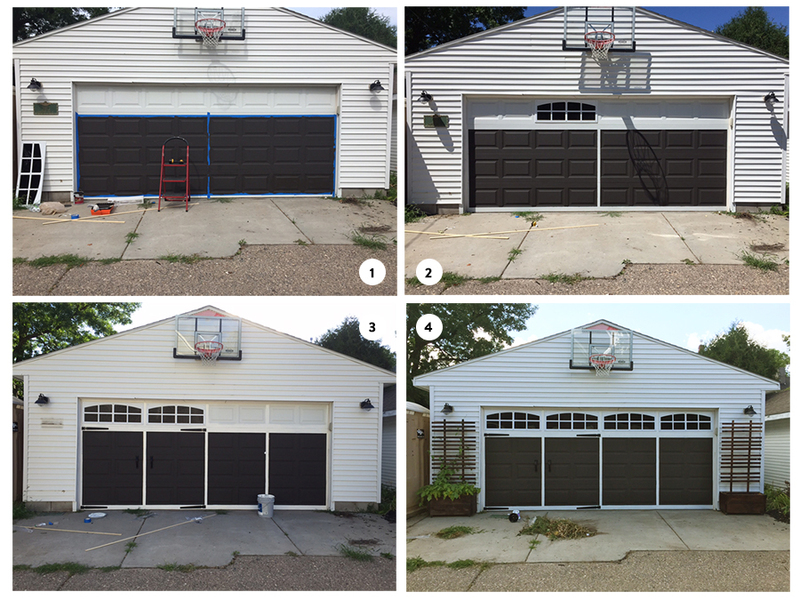 My thoughts exactly – I didn’t want to spend too much on an alley garage door makeover. I hope you’re parking situation changes for you soon, sounds rough. Alleys are a crazy world! As the next door neighbor to this garage I just want to say that it is getting impossible to keep up with all of the upgrades that you are doing. The garage looks great! Now we can work on mine….! Hey Erika, I got the house numbers over here. as a fellow s.mpls person – alleys are a BIG deal around here (a communal space for all people including garbage men and pickers) and the nice ones are certainly noticed! NICE WORK!! that is AMAZING. i didn’t know windows like that existed either- what a change! I know right, kind of funny that they do exist, huh? Yup, your description of alleys is the exact same in Chicago! Our garage is directly behind our home off of an alley, and we actually have to be careful to not make it look TOO nice… That would be tempting for sticky fingers! The good part of an alley, though, is not seeing trash cans or bags on the curb. Definitely keeps the city a little bit more clean. I am blown away by this project, and before I read your post, I was staring at those photos and wondering how in the world you added windows so quickly! Awesome. Yes, too true. You don’t want to make an alley to enticing. I would really like to come up with a better solution for my garbage cans too, that might have to be a goal for next summer. Love the way your garage is coming along too, I’m inspired! That looks fantastic! We are on one of the SW Mpls streets that doesn’t have alleys, but I’ve driven down friends’ alleys and your garage is nicer than any other one I’ve seen! Great job; hope it inspires your alley-mates to up their game! Jaw-dropping! Seriously, I love this project! 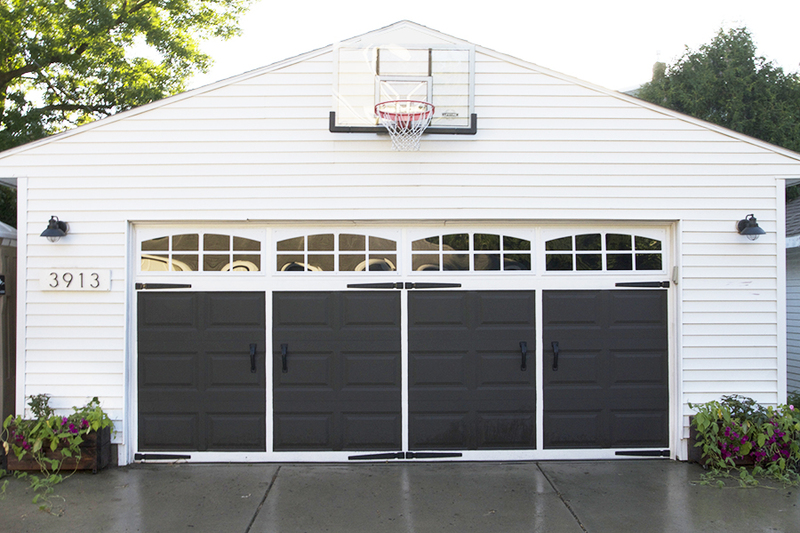 question – does the hardware get in the way when you open the garage? I have a garage door opener and it looks like they might get stuck when the doors retract? Hey Erin, Good question. No it doesn’t. The garage opens at an angle and the hardware slides right by. I was worried about that too and did a lot of test opening and closing to see how all the mechanics worked before I decided this would be a good idea. I didn’t see anything about what you did to your concrete driveway.. did you resurface it or just spruce it up somehow? what a difference! love the changes. and if you hadn’t said those windows were fake i would never have known. they are genius! 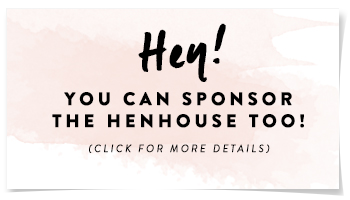 Use this site to match your items with a local charity and arrange pickup. MAKE A PLAN Now that the garage is empty, avoid the common mistake of hastily rushing out to buy organizational products. Wow that is amazing. I love what you have done with the garage door. it is a great touch and give it some character. i will need to think about doing something like this for garage door. I have been looking into finding a new way to change my garage door. i will need to talk my husband to see if there something similar or if not different that we can do. thanks for posting this blog. 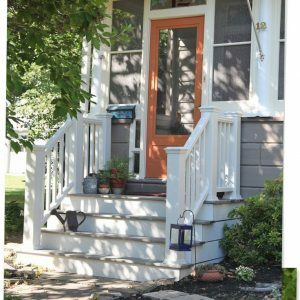 This Old House magazine just featured this project. September 2017. P 42. Hurrah! 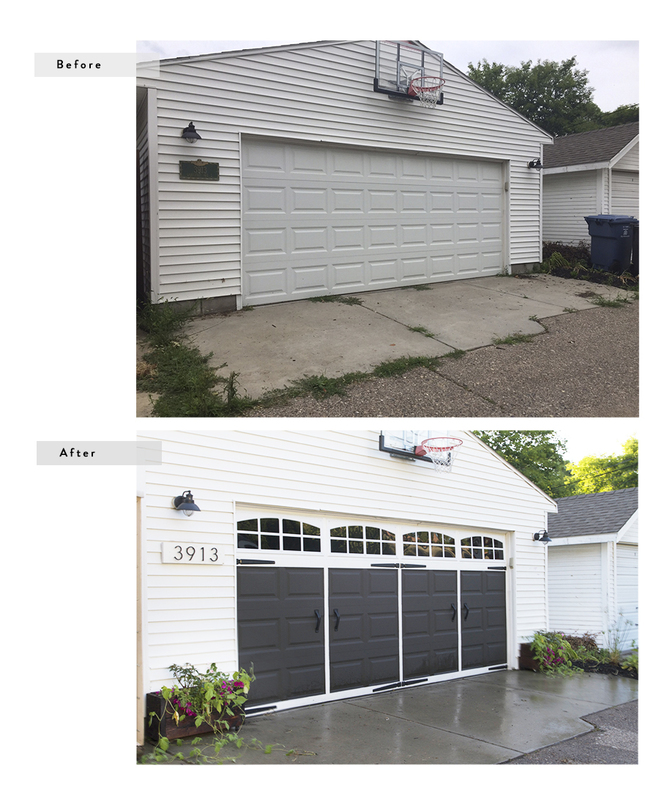 LOVE your makeover garage door! What an improvement! Keep up the great work!! !